Shingles is a painful skin rash caused by the chickenpox virus. If you come down with this irritating rash, here is how to treat shingles naturally at home. Have you ever had chicken pox as a kid? If so, the odds of getting shingles later in life are about 1 in 3. I recently had a bout of shingles and decided not to pay a visit to my doctor. I chose to treat shingles naturally. Although there is no cure for shingles, treating shingles naturally at home can speed recovery. Before the varicella vaccine became available, chickenpox was a common childhood disease. My three kids were all born after the chickenpox vaccine came out and all of them have had the vaccine. So, I never had to deal with a chickenpox outbreak as a parent. However, I suffered from chickenpox when I was a young child. I was only 3 or 4 years old when I got the chickenpox so I don’t recall the ordeal. Chickenpox is a virus that remains in your body after your symptoms have cleared. It is very similar to the herpes virus in that it remains in your body, dormant. Like the herpes virus, stress often triggers the virus to come out of dormancy. Age is also a factor. I got shingles at the age of 45, a few days after returning from a 5 day vacation. Prior to the vacation, I had a really bad respiratory infection which lasted over 10 days so I gave into the advice of my doctor and took an antibiotic. The symptoms of my infection had cleared a week before leaving for vacation, but my immune system was certainly affected. It didn’t help that I was staying up later during the vacation, but waking up at my normal time. Clearly, a weakened immune system along with lack of sleep led to my shingles outbreak. Luckily, the outbreak was mild for me. A couple days after returning from my vacation, I developed a small rash on my lower back near my spine. In addition to being itchy, it was causing intermittent pains. Prior to the rash, I had felt a lot of soreness in my back. It was the kind of back pains that I usually fix with a visit to the chiropractor. I had been carrying my 3 year old daughter a lot on the vacation so I just assumed my back got out of adjustment from carrying her on one side. At first, I thought the rash on my back was caused by bug bites. I even thought we may have brought home bed bugs from our trip. However, after my husband took a good look at it, he told me the rash looked very similar to a bout of mat herpes that our son got from wrestling. After a day of internet searching, I stumbled upon a photo of shingles and knew that was what I had. To speed recovery, I knew I had to find out how to treat shingles naturally. Before I realized that I had shingles, I was rubbing a grapefruit seed extract (GSE) skin ointment with lysine onto the rash. I had bought it for my son’s mat herpes rash, but he never used it. I used the ointment as a precaution in case the rash was viral or bacterial. My rash may have spread more had I not used this ointment right away. Lysine has been shown to inhibit replication of the herpes virus which is similar to the chickenpox virus. So, using the GSE ointment with lysine in the beginning likely controlled the virus from spreading. 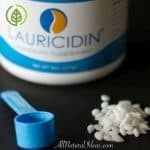 Once I determined that I had shingles, I took a trip to the natural food store and picked up some oral lysine supplements along with a salve made specifically for shingles and herpes. 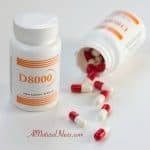 Treating shingles naturally at home was the remedy I chose to make a quick recovery and rebuild my immune system. I took 2000mg of Lysine a day and rubbed on both skin ointments daily for a couple week. Since I knew my immune system needed help, I also began to take a teaspoon of colloidal silver seven times a day for a short term immune boost. Most of the pain had diminished after a week. After a couple weeks, the scabs were reducing in size. Other than the remaining scabs, my symptoms had pretty much cleared up after 3 weeks. You may be wondering if there is a preventative. Unfortunately, there is no technique that can 100% guarantee you won’t get shingles. However, there are some natural precautions you can take. The key to preventing shingles is thinking of ways to keep the virus dormant. This is because you cannot eliminate the virus. When you are stressed, your immune system is broken down. This is usually what causes the shingles virus to come out. How can you keep your immune system strong? You can take colloidal silver, L-lysine, and other similar products as a preventative in times of stress, lack of sleep, or when you are ill. 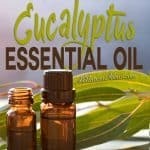 These natural remedies have helped prevent my cold sore outbreaks during stressful times. If you are suffering from shingles, these remedies to treat shingles naturally may alleviate and shorten the time of your outbreak. 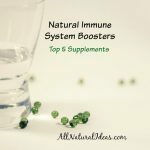 If you are lucky and have not had an outbreak, but have had chickenpox in the past, taking natural immune boosting supplements may prevent and prolong an outbreak from occurring. 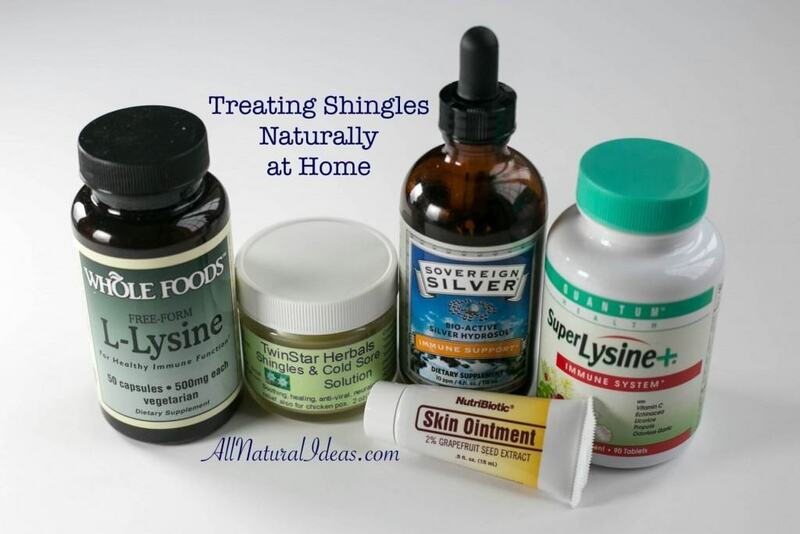 Daily supplements of L-lysine and colloidal silver are excellent for treating shingles naturally. Natural skin ointments can also help your skin heal quickly. Now that I’ve recovered from my shingles outbreak and am no longer in a contagious state, I will make an appointment with the chiropractor. Since my shingles rash occurred in an area of my back that felt out of adjustment, I wonder if the spinal alignment itself contributed to the shingles outbreak. My back has been severely mis-aligned in the past, but it never occurred during a time when my immune system was low. Keeping your spine in proper alignment with visits to your chiropractor as needed may also be another natural method for preventing shingles. After an initial chickenpox infection, the varicella virus travels from the nerve endings near the skin and settles into the nerves along the spinal column where it lays dormant. Is it possible that a disruption to the spinal column along with a weakened immune system could lead to a shingles outbreak? This post seems to suggest there is a relationship. I recently got a bad burn on forearm. And about 3 days later I’ve developed this cluster of little red bumps all around butn that look an awful lot like shingles. Just wondering if my burn could trigger that. Mainly very itchy, but that might be my burn healing. Pain mainly from burn. It’s hard to say. A burn can also develop blisters. I had a burn from an infrared light, not to severe that went away. Months later I had a outbreak of shingles the main area on that very spot. I am 58 and was under major stress And the virus found the weakest spot I guess. Treating it with ozone oil and sleeping in the hyperbaric chamber that I got from Better Way Health solutions. Both are good for the skin but help also to support the body at a much deeper level. Oxygen to wipe out these pathogen’s. The dr. gave me some pills for the early stage. I’m doing this all While juicing feasting a variety of vegetables and apples.